“The advantage of textiles is they already have a 3D structure so they are great at absorbing light, which in turn speeds up the process of degrading organic matter,” he said. When the nanostructures are exposed to light, they receive an energy boost that creates “hot electrons“. These “hot electrons” release a burst of energy that enables the nanostructures to degrade organic matter. Drop of water. “Hydrogen production through an electrochemical process is at the heart of key renewable energy technologies including water splitting and hydrogen fuel cells,” says Professor Yao. Professor Xiangdong Yao and his team from Griffith’s Queensland Micro- and Nanotechnology Centre have successfully managed to use the element to produce hydrogen from water as a replacement for the much more costly platinum. “Hydrogen production through an electrochemical process is at the heart of key renewable energy technologies including water splitting and hydrogen fuel cells,” says Professor Yao. “Despite tremendous efforts, exploring cheap, efficient and durable electrocatalysts for hydrogen evolution still remains a great challenge. “Platinum is the most active and stable electrocatalyst for this purpose, however its low abundance and consequent high cost severely limits its large-scale commercial applications. “We have now developed this carbon-based catalyst, which only contains a very small amount of nickel and can completely replace the platinum for efficient and cost-effective hydrogen production from water. “In our research, we synthesize a nickel-carbon-based catalyst, from carbonization of metal-organic frameworks, to replace currently best-known platinum-based materials for electrocatalytic hydrogen evolution. Proponents of a hydrogen economy advocate hydrogen as a potential fuel for motive power including cars and boats and on-board auxiliary power, stationary power generation (e.g., for the energy needs of buildings), and as an energy storage medium (e.g., for interconversion from excess electric power generated off-peak). Professor Yao says that this work may enable new opportunities for designing and tuning properties of electrocatalysts at atomic scale for large-scale water electrolysis. The above post is reprinted from materials provided by Griffith University. Note: Materials may be edited for content and length. Printing has come a long way since the days of Johannes Gutenberg. Now, researchers have developed a new method that uses plasma to print nanomaterials onto a 3-D object or flexible surface, such as paper or cloth. The technique could make it easier and cheaper to build devices like wearable chemical and biological sensors, flexible memory devices and batteries, and integrated circuits. One of the most common methods to deposit nanomaterials—such as a layer of nanoparticles or nanotubes—onto a surface is with an inkjet printer similar to an ordinary printer found in an office. Although they use well-established technology and are relatively cheap, inkjet printers have limitations. They can’t print on textiles or other flexible materials, let alone 3-D objects. They also must print liquid ink, and not all materials are easily made into a liquid. Some nanomaterials can be printed using aerosol printing techniques. But the material must be heated several hundreds of degrees to consolidate into a thin and smooth film. The extra step is impossible for printing on cloth or other materials that can burn, and means higher cost for the materials that can take the heat. 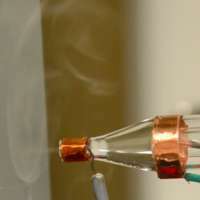 The plasma method skips this heating step and works at temperatures not much warmer than 40 degrees Celsius. “You can use it to deposit things on paper, plastic, cotton, or any kind of textile,” said Meyya Meyyappan of NASA Ames Research Center. “It’s ideal for soft substrates.” It also doesn’t require the printing material to be liquid. The researchers, from NASA Ames and Stanford Linear Accelerator Center, describe their work in the American Institute of Physics journal Applied Physics Letters. They demonstrated their technique by printing a layer of carbon nanotubes on paper. They mixed the nanotubes into a plasma of helium ions, which they then blasted through a nozzle and onto paper. The plasma focuses the nanoparticles onto the paper surface, forming a consolidated layer without any need for additional heating. The team printed two simple chemical and biological sensors. The presence of certain molecules can change the electrical resistance of the carbon nanotubes. By measuring this change, the device can identify and determine the concentration of the molecule. The researchers made a chemical sensor that detects ammonia gas and a biological sensor that detects dopamine, a molecule linked to disorders like Parkinson’s disease and epilepsy. But these were just simple proofs-of-principle, Meyyappan said. “There’s a wide range of biosensing applications.” For example, you can make sensors that monitor health biomarkers like cholesterol, or food-borne pathogens like E. coli and Salmonella. Because the method uses a simple nozzle, it’s versatile and can be easily scaled up. For example, a system could have many nozzles like a showerhead, allowing it to print on large areas. Or, the nozzle could act like a hose, free to spray nanomaterials on the surfaces of 3-D objects. The method is ready for commercialization, Meyyappan said, and should be relatively inexpensive and straightforward to develop. Right now, the researchers are designing the technique to print other kinds of materials such as copper. They can then print materials used for batteries onto thin sheets of metal such as aluminum. The sheet can then be rolled into tiny batteries for cellphones or other devices.